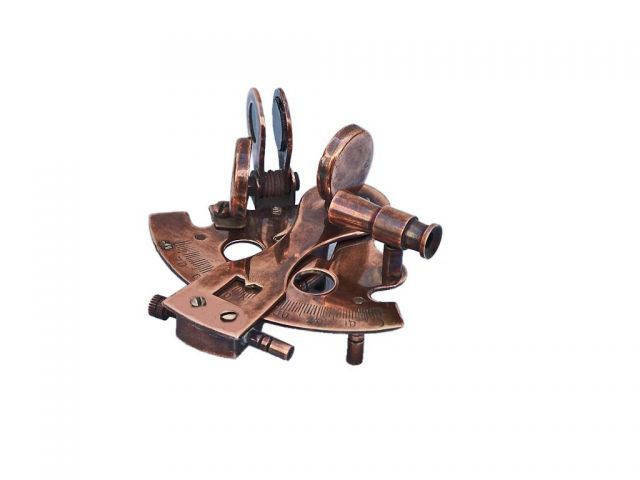 This Hampton Nautical premium 3-inch radius Antique Copper Sextant Paperweight 3" is our finest miniature brass sextant. A beautiful desktop accessory, the sextant is a reproduction of a small lifeboat sextant used in emergencies for navigation. Despite it's small size, it is meticulously and precisely crafted. It has a gear-driven adjustment of the elevation angle and 'Hampton Nautical' engraved on the sextants limb. While this sextant is fully functional, it is NOT calibrated nor intended for navigation. This sextant is available in a beautiful polished antique copper finish.